I finished a Working Out Loud Circle* this week. Twelve weeks of meeting for an hour with three industry colleagues scattered across three Australian states. Three people I did not know at the start of the year. Now I have a close bond to each of them – as individuals and a group. I’ve also made significant progress on a goal that mattered to me, through a process of purposeful discovery and building relationships. In mid-2018 I facilitated a Social and Collaborative Learning course which runs over eight weeks. A handful of the participants were very active in both the core course platform and on a Slack forum and public social media. One of them commented that she felt she had found her tribe. I felt energised by my interaction with these people and the progress they were making with social learning in their organisations. At the time I was in the midst of an extended period of travel, which can be a little isolating. I felt that continuing our connection would be helpful for me both socially and in my work. A WOL Circle was an obvious and appropriate pathway to achieve this. Two of the group agreed to join the Circle. Our fourth member was someone I had begun interacting with online that was interested in building her network. That week we spoke a lot about how we felt about sharing aspects of our personal life at work. We each had different levels of comfort with this. It reminded me of Google’s Project Aristotle research into what made teams effective. They discovered that psychological safety was the key. This article about the research includes the story of an engineer at Google, Matt Sakaguchi, who wanted to improve how his team ‘jelled.’ One thing that shifted how the team interacted was Sakaguchi telling the team he had cancer, something he had not disclosed for many years. It opened the way for others to share more about themselves and to have more honest discussions about work. One of our Circle members started experimenting with sharing a little more about herself with work colleagues. In our final meeting she reflected that this was not what she had expected from the Circle process. Others agreed that the Circle process had led them down unexpected pathways – and that this had been valuable. A common misperception of those who haven’t done a WOL Circle is that you are only building relationships with those in your group. The intent is that your peers in your Circle are there for support and to amplify your learning and building of good habits to support you as you engage with others beyond the Circle. A good Circle is a space to look outward from. It’s a set of people who encourage and empower you to build relationships and a network outside of the Circle. 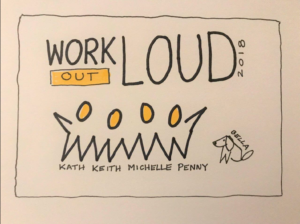 Building intimacy, trust, and psychological safety in our Working Out Loud Circle did not make us insular – it made us bolder, more courageous in the world, more likely to connect with others. I have more I’d like to share about this Circle, especially about how it supported me to make significant progress on an important goal. However, I will do this in another post. I just want to leave you to sit with the power of having a trusted group of people who help you be bold, courageous and build better relationships with others. * If you are unfamiliar with Working Out Loud Circles go to www.workingoutloud.com for information and free resources to run your own Circle. This entry was posted on December 14, 2018, 5:59 am and is filed under Networking, Social Learning, Working Out Loud. You can follow any responses to this entry through RSS 2.0. You can leave a response, or trackback from your own site.